An update to the post below – the film has been selected to be shown this Sunday, November 7, 2010 at 6pm on the main stage in the Jardin in San Miguel as part of the opening ceremonies for this year’s feria de lana y laton (wool and brass fair) and on Monday November 8, 7-9pm in the same location. If you missed Thursday’s show, be sure to come by the Jardin during those times to see it. 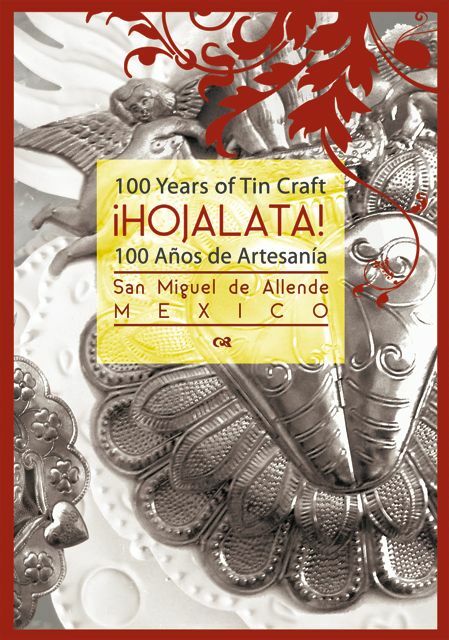 If you are in town this Thursday at 7pm, you can see the video documentary I have made about the history of decorative (and utilitarian) tin work in San Miguel de Allende. If you live here, or have just visited, you can’t miss the tinkering of tools on metal here. It’s everywhere, in all neighborhoods. Literally hundreds, if not a thougsand people or more work in tin here. Over the years, because of purchasing tin work for our store in the U.S., I’ve been going in and out of these shops wondering how it all began. There are a handful of families that go back exactly one hundred years, to 1910, when a metal worker, Aucensio Llamas moved to San Miguel from Jerez Zacatecas. For twenty five years he made and repaired milk cans, oil lamps and colanders for making atole. There was no tourism, no market for decorative or religious tin work. In the late 1930’s and into the 40’s when Stirling Dickinson arrived and began to bring more foreigners to attend the art school he helped to found, a market for decorative pieces developed along with creative inspiration and eventually an industry that put almost all of San Miguel to work. I won’t go into the rest because … we’d like you to come see it on Thursday. Many of the artisan families who are in the movie will be there for the premiere and we’ll have a question and answer afterwards so you can meet the original families, now in their third and fourth generations of family business. The film includes these men talking about their history in tin work,, the unfolding of an international business market for them along with their personal feelings about their work and how it has changed over the years. Voices are overlayed with photos and video footage of them creating pieces in their workshops. These men create some of the most beautiful tin work in San Miguel today. The documentary combines these men talking about their families, the lean and boom times, what it was like to begin making decorative pieces after doing utilitarian work and what it was life was like here in the early part of the 20th century. It’s a new perspective on the history of the town, told by the families who lived and grew through the ups and downs of of town economies that are driven by tourism. The film will be shown at the Santa Ana Theatre at the Biblioteca on Calle Insurgente. Thursday Nov. 4, 2010 7pm, with an introduction to the artisans after the show. In the words of the artisans, in Spanish, with English subtitles. Congratulations Suzanne! You are a real winner and I am sure that Stirling Dickinson and his contemporaries would heartily echo that. More power to you! Thank you Bob, you are too kind! Believe it or not, and I’m sure you do, it has been through about another five rounds of editing. Just couldn’t help myself! Congratulations Suzanne! I know how much work and heart you have put into this and the result is such a wonderful tribute to the tin workers of San Miguel. I am excited to be there tonight! Felicidades Suzanne! I know how much work and heart have gone into creating this video. The result is such a wonderful tribute to the tin workers of San Miguel. I am really looking forward to seeing it on “the big screen” tonight. Well done amiga!